This amazing removable tape is the one you see myself, Julia Watts and Sue Wilson using on TV to hold our dies in place when running through the die cutting machine. It's 19mm wide and a huge 32.9m roll and you can re-use it until it loses it's tackyness. 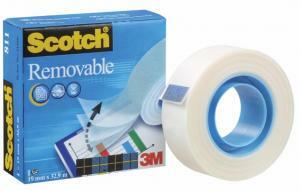 Absolutely the best removable tape I've used and there is no sticky residue left on your card/paper and it doesn't tear your card/paper either! If you use cutting dies, stencils or masks,.. you need this in your tool box!